We designed a new control system specifically for the Pure V1, incorporating a trimmer-less system to keep it clean and easy to use. 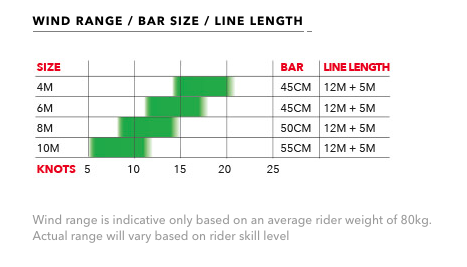 The back leader line knots provide the trim option to increase power, turn speed and feeling on the bar. The Pure V1 has been developed using relatively short flying lines, the 12m lines are the ideal length for newcomers to safely learn and progress. Included in the package are 5m line extensions for an increased wind window, providing more power for lighter wind days. Self-landing the Pure V1 is simple and easy by pulling the brake handle between the back leader lines on the control system; the kite will stall down to the ground when you are ready to launch again simply let go of the brake handle to re-inflate the kite. Our time-proven Front Line Flag Out is simple and effective. If you need to immediately stop all power from the kite, activate the release system and the Pure V1 will flag out to one front line, immediately stopping all power delivery.